Point2 Homes gives you far more than a simple list of houses for sale. Get instant access to a lot of relevant information about Kemptville, ON real estate, including property descriptions, virtual tours, maps and photos. The search results pages also have a wealth of information on Kemptville, ON, if you scroll all the way down. 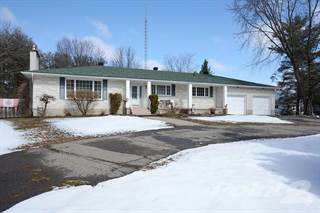 There are 53 houses for sale in Kemptville, ON. 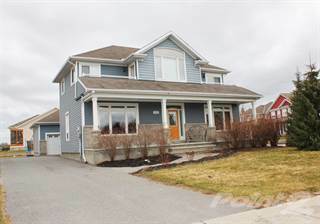 Searching homes for sale in Kemptville, ON has never been more convenient. With Point2 Homes, you can easily browse through Kemptville, ON single family homes for sale, townhomes, condos and commercial properties, and quickly get a general perspective of the real estate prices. Also, you’ll never miss a bargain if you filter listings based on house price drops in the past six months. Use the map view to find Kemptville, ON homes and apartments for sale, based on amenities or city features that you may want close by. You can close in on a specific neighbourhood or area by simply drawing around them with the polygon or radius tools. Stay informed about the latest entries on the real estate market by saving your searches. This way, you get new listings in your inbox, daily or every week, based on your preferences. If you’d like to get in touch with a professional, agents are displayed next to their listings, and they’re easy to contact through the online forms. If you want more options, you can click the Tools tab and Find an Agent, and you’ll get a list of helpful and knowledgeable real estate agents in Kemptville, ON. Visit the Point2 Homes blog and you can find up to date expert advice on many markets throughout Canada, regular market reports, neighbourhood scoops in cities throughout the provinces, real estate deals and useful recommendations. Kemptville is located in the southeastern portion of the province, near the communities of Ottawa, Chesterville, Spencerville, and Merrickville. This city of over 3,000 people covers 3.21 square kilometres and is situated equidistant from the Ontario/Quebec border to the north and the Canada/U.S. border to the south. Highways 43 and 416 (Veterans Memorial Highway) meet in the city, and Highway 416 provides access to the Canada/U.S. border. Kemptville Creek runs through the city, travelling from the Rideau River located north of the city. The outskirts of the city are almost entirely made up of farmland. Kemptville’s northern section includes residential areas, a large commercial section (with retail stores, restaurants, and service providers), schools, government offices, a medical clinic, a post office, a bowling alley, a community centre, a fire station, an Ontario Provincial Police station, and churches. In the northern section of the city, there are residential areas, churches, parks, accommodations, restaurants, shops, service providers, government offices, a post office, a library, a pool, schools, and a curling club. Schools, residential areas, a hospital, churches, service providers, shops, and an industrial area make up the southern section of Kemptville. Geraldine’s Gallery is a private art gallery featuring works by local, national, and international artists. The gallery is located in a heritage home that can be rented for meetings and special events. Tours of the gallery are by appointment only throughout the week. An onsite framing shop provides professional custom framing of art, documents, and photography. The North Grenville Municipal Centre offers two ice rinks, community halls, boardrooms, and a performance theatre. The venue is used for hockey, ice skating, meetings, community events, and private functions. Features include bookable rooms, kitchen facilities, a concession area, and rentable audio and visual equipment for presentations. Rideau River Provincial Park is located north of the city along the Rideau River. The park offers boat launches, campsites, shower and flush toilet facilities, picnic areas, beach areas, a laundromat, a general store, and equipment rentals (canoes, floatation devices, and fishing gear). Popular activities at the park include swimming, boating, canoeing, fishing, picnicking, birdwatching, wildlife viewing, and hiking. Frogs, turtles, herons, bass, walleye, panfish, muskie, and osprey are just some of the birds, animals, and fish that can be found in the park. Kemptville’s key industries include technology, agriculture, tourism, transportation, and manufacturing. Besides production, the agriculture industry in and around the city involves genetics services, input companies, and marketing. The Kemptville Centre for Rural Advancement is a new multi-building facility with a focus on improving the economic viability of rural communities. The tourism industry involves restaurants, accommodations, service providers, and local shops. Kemptville’s location makes it a strategic choice for transportation services, as the city has easy access to the Canada/U.S. border, as well as the major city of Ottawa. North Grenville Economic Development provides information, resources, support, marketing, and networking opportunities for local businesses, large and small. 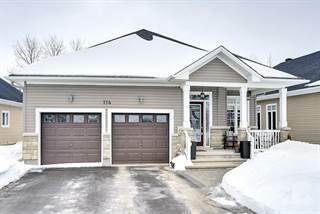 Kemptville’s northern section has mostly single-family homes with low to mid-range prices. Most of these are on large lots, sometimes with a more rural feel. There are some older condo options available as well in this section, at affordable prices. In the central section, single-family homes range in size and price. Smaller homes with less land offer affordable options, while larger homes on sprawling lots come in at a higher price point. There is plenty of vacant land available in this section, with prices depending on location and size. Commercial property and reasonably priced condo options can also be found here. The majority of the real estate in the southern section of the city is single-family homes, normally at mid-range prices. Lot sizes are a bit smaller closer to the central section, and tend to be larger along the edges of the city. Vacant land can also be found in this section. Schools in Kemptville include Holy Cross School, Kemptville Public School, St. Michael Catholic High School, North Grenville District High School, Madison Montessori Academy, South Branch Elementary School, École élémentaire publique Rivière-Rideau, and Ecole Saint Margerite Bourgeois. Other options can be found in nearby communities and include Centennial School, Oxford-on-Rideau Public School, Nationview Public School, and Inkerman Public School. There are no post-secondary options in the city, so residents must travel to nearby communities to access options such as Algonquin College, Willis College, Carleton University, and the University of Ottawa.